The Bishop of San José de Mayo: "a pastoral reconfiguration to put everything we are and we have at the service of the mission"
Canelones (Agenzia Fides) - In the country with the lowest number of Catholics in Latin America (42% of the population of whom only 1% say they go to mass on Sunday), the missionary impulse is a challenge to dialogue with society and greater participation of the laity. This is the thought of Fr. Leonardo Rodríguez, National Director of the Pontifical Mission Societies (PMS) of Uruguay, in a conversation with Agenzia Fides. "The ecclesiology of the people of God, which makes us all jointly responsible in the mission, is the key to the mission in our Country", underlines the priest. For this reason, and considering that 2019 is in Uruguay election year, the PMS and the Uruguayan Bishops have established, in view of the Extraordinary Missionary Month of October, "very concrete and realistic" objectives: to strengthen the department for the mission of the Bishops' Conference, promote the same vision of mission in the Church in the episcopal commissions and conclude the pastoral three-year period by channeling all energies towards the Extraordinary Missionary Month. The activities related to the electoral campaign and the elections would make the participation in major ecclesial events difficult, this is why the decision for a "change of mentality" in the approach to the mission of the Church was reached. The opportunity given by the Extraordinary Missionary Month will therefore be taken in order to "strengthen the Missionary Department of the Bishops' Conference and its objectives with simple and concrete programs", explains Fr. Rodríguez. The objective is to form the missionary conscience in line with the indications of Pope Francis and according to the guidelines of Cooperatio missionalis, "a document of 1998 still in force", says the priest. 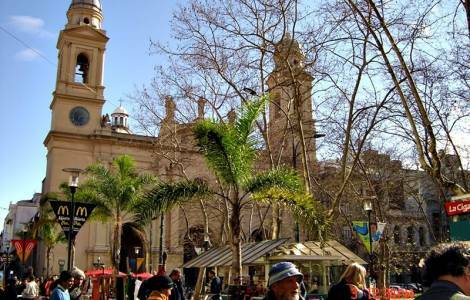 In Uruguay the National Director of the PMS is also the Secretary of the Missionary Department of the Bishops' Conference, therefore, in the visits to the dioceses, Fr. Leonardo meets the Bishop and his missionary team. On these occasions he helps to analyze and make the missionary plans adequate to the needs and opportunities of the place concrete, but above all to concert "a same way of being Church", "that goes forth". It is not a question of giving a missionary imprint to pastoral activities, but of enhancing the inclusion of the laity in the social sphere and of supporting their evangelizing action. "In the hierarchy there is sometimes fear of opening up possibilities for the laity, especially young people, so that they create adequate spaces for the mission", observes the priest. "Priests and Bishops have a tendency to clericalize the laity, placing them in ecclesial structures", he continues, "thinking that this is a pastoral success. But the real success in the lay mission is its action in the society where it is integrated. Otherwise we are a self-referential Church”. For Fr. Leonardo Rodríguez it is "a huge change of mentality" and a "long path to travel".